Polyfil Stuffing or your favorite doll stuffing. Note: This project requires that you already know how to cast on, knit, purl, increase stitches, change colors, and bind off. See additional pictures for placement help. Stitch all parts on with "Bernat Boucle" yarn except for the ears, which should be stitched on with face color yarn. Find the seam on the lamb’s body. The seam will be the belly of the lamb. The end of the body that you finished stuffing and stitching up will be the tail end of the lamb. Find that end and lay the lamb belly side up. With Boucle yarn, stitch 2 of your finished legs on either side of the belly seam with the leg seam edges pointed in toward the belly and the legs lined up with the end of the body. Turn the body around and stitch the other 2 finished legs on either side of the belly seam with the leg seam edges pointed in toward the belly and the legs positioned ½ inch to 1 inch from the end of the body. Stitch the wide end of the tail onto the tail end of the lamb body. Place the lamb’s head in position as you would like and begin stitching it to the body. For a less floppy head, stitch a wide circle of the head to the body. Stitch the wide end of the ear to the lamb’s head tightly. You may want to curve the edge slightly while stitching them on to give the ears a more natural curved look. Use some pink yarn to stitch a small nose onto your lamb. 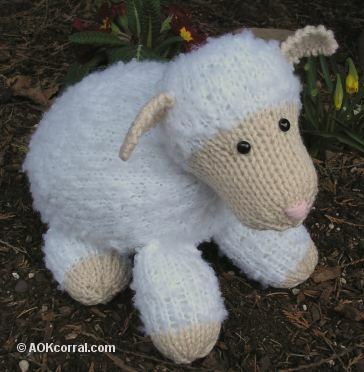 Make this adorable, soft lamb doll for someone of any age.